"If we do not change direction, we are likely to end up where we are going. 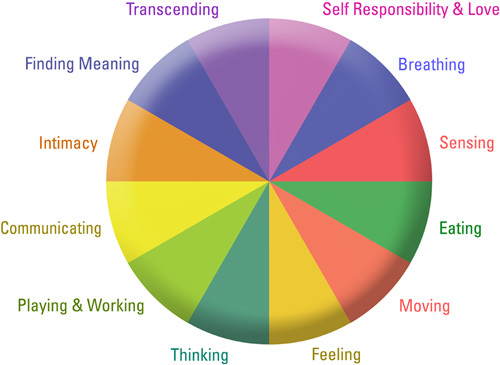 Whole Heart Communications uses a unique whole-person model for coaching that explores life through twelve dimensions, called The Wellness Inventory. Reflecting on life through the twelve dimensions of the Wellness Wheel, you gain insight into the ways you may overuse your strengths and avoid areas of possible growth. It also provides an opportunity to prioritize what you are most motivated at the time to change. Working within this model you begin to see how the dimensions are intertwined creating a holographic map for life. Practicing in one area you automatically influence and strengthen other dimensions. Combined with mindfulness practices and small action steps, you begin to confidently engage life from your natural wholeness and learn to thrive. Working with Amy is a professional partnering between a coach and a person ready to take charge of their life. The coach's job is to support you, the client, in identifying dreams and desires. Then look carefully at motivation and barriers that inspire or inhibit the change you seek. Next small goals are set and you begin the practice into your desired change. It's Amy's job to listen, question, challenge, confront and hold you accountable for what you say you most want. It's a dynamic and fluid relationship that leads to whole hearted living. The coaching process helps facilitate healthy, sustainable behavior change. Partnering with Amy is a deep dive into seeing yourself honestly and unedited, an investigation into what your heart most desires, and taking steps to create that future. With Amy's heart centered coaching approach, you learn to live into the possibilities and potential that leads you home to yourself.